After three years of development, Niner’s full suspension gravel bike will be available in late 2019. Niner Bikes has made no secret that it’s in the late stages of developing a full suspension gravel bike. Far from being secretive, the company developed its proofs-of-concept in full view of the public. Following three years of development, the Fort Collins, Colorado-based brand plans to bring the Niner MCR 9 RDO to market before the end of the year. 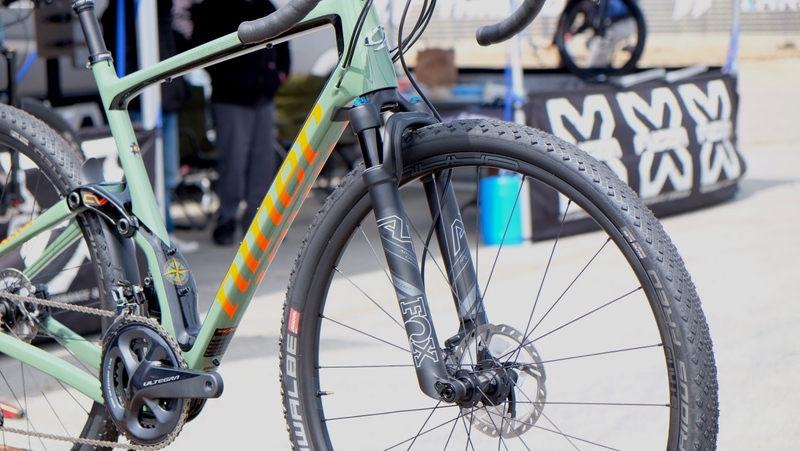 At the 2017 edition of the Sea Otter Classic, Niner showed off a modified version of its full suspension cross-country race bike, the RKT 9 RDO, in gravel guise with drop bars. Then last year, Niner demonstrated it was moving forward with the concept by showing off a plastic model of what will become the MCR 9 RDO. Upfront, the MCR 9 RDO on display sported a 40mm Fox AX suspension fork. 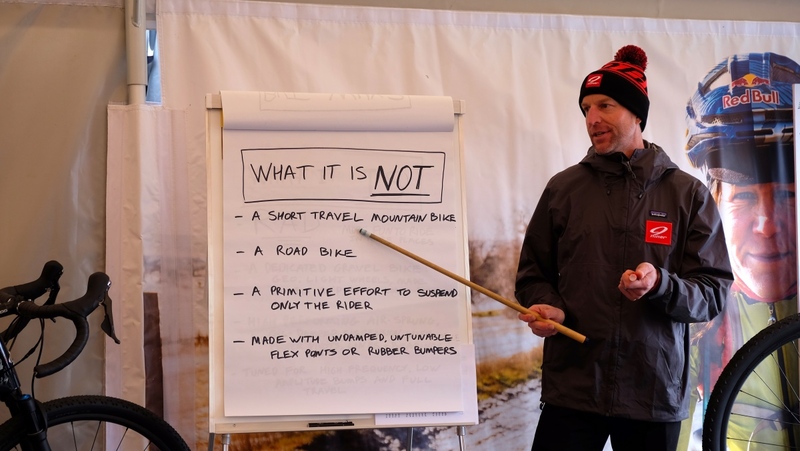 And on the first day of this year’s Sea Otter Classic, Niner hosted a press conference to discuss the finer points of what will become the first mass production full suspension gravel bike. According to Niner marketing manager Zack Vestal, the CVA suspension has been tuned specially for gravel terrain by focusing on absorbing high-frequency, low-amplitude impacts encountered on rocky and rutted roads. The Niner MCR 9 RDO has 50mm of rear suspension travel. The X-Fusion shock on the display model featured a handlebar-mounted lockout to firm up the rear end for sprinting and riding on pavement. The MCR 9 RDO has 50mm of rear wheel travel. Upfront, the MCR 9 RDO was equipped with a 40mm-travel Fox AX suspension fork. As with much of the specifications, it’s possible this could change by the time the bike becomes available to the public. In addition to selecting the model’s components as more gravel-centric products launch this season, Niner is also refining the layup of the full carbon frame. Features Niner confirmed will be part of the production bike include mounts for two water bottles inside the main triangle and a third on the bottom of the downtube. 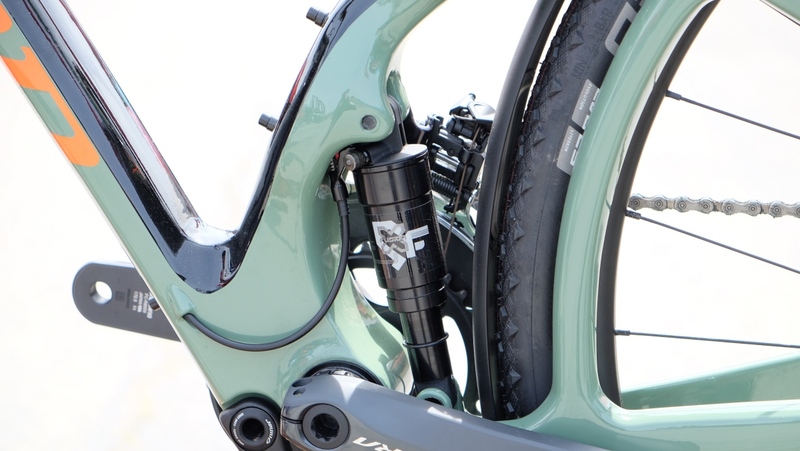 There are also mounts for a bolt-on feedbag and mounting points within the front triangle for a strapless frame bag. The Niner MCR 9 RDO frame will also feature full internal cable routing with the option to run a dropper seatpost. Tire clearance is ample, with the ability to run 700×50 or 27.5×2.0 tires. Niner marketing manager Zack Vestal explaining the finer points of this new model at the 2019 Sea Otter Classic in Monterey, California. Price and weights are yet to be determined. 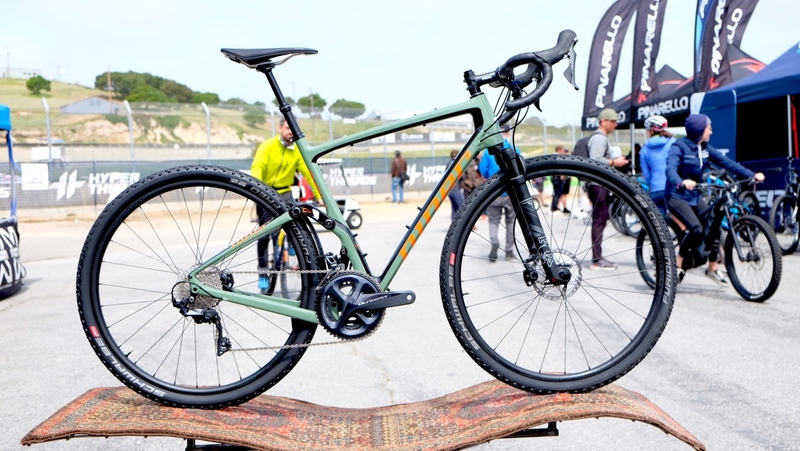 Niner product manager Barrett James noted that the weight of the complete bikes should be similar to the RKT 9 RDO, which gives this full suspension gravel grinder a target of roughly 23 pounds. Likewise, pricing for the MCR 9 RDO frameset will be comparable to Niner’s full suspension carbon frames, which sell for $3000. For more details keep an eye on ninerbikes.com. 23 pounds, I don’t believe it. Is that a semi rear fender or a place to store debris from the road. Why not believe 23 lb? Too heavy? I think thats a fender to help prevent dirt/stones/gravel from hitting the shock, and wedging in the pivot area. With a 1x setup and no dropper post, the weight sounds plausible. The “fender” is there to keep mud off the shock. That’s an XC bike with drop bars. Who are they fooling!!! But hey, if it sells and if it makes money, then the end justifies the means. Bikers that have money to burn will buy it because gravel is so much sexier than XC. XC appears to be stale as a term now. “Hey I just spent $5K on an XC bike”. Oh well. been there done that apparently. Anything interesting to say? “Hey I just bought a $5K cutting edge gravel bike!” That will provoke interest. It’s just a very expensive way to provoke interest.